FORESTS IN THE OLDEST CYCLES OF RIGVEDA. Abstract. The article deals with the description of forests and trees in the most archaic parts of Rigveda (Mandalas II-VII and IX). The author demonstrates that the Rigvedic Indo-Aryans lived in immediate proximity of the forests, visited them regularly, used them as source of wood and food, gave names to at least five of the endemic trees of Hindustan, divinized and worshipped trees and considered them aspects of the Divine Mother and Devas. Key words: Rigveda, Indo-Aryans, forests, trees, Ashvattha, Harappa. The translator of Rigveda  (further RV) into Russian T.Ya. Elizarenkova is an adherent of the Aryan Invasion/Immigration Theory and as such she states that Rigvedic Indo-Aryans (further IA) entering Hindustan were mostly nomads previously living in the vast open spaces of the Eurasian steppe. Speaking of the forests’ role in life of RV authors she writes: “Aryans of RV knew of the forests but they had not yet made use of them. The term vána- seldom means ‘forest’ in this text. Forest was thought of as something remote and unfamiliar. It was contraposed to home/a house (amā́, dáme) and to a village (grā́me)... This opposition is a variant of a more generic one: ‘own’ - ‘alien’ or ‘inner’ - ‘outer’. When the term vána- is used in RV in the sense of the ‘forest’ in most cases it means a place which scares and which is attacked by the Aryan gods (Agni, Indra, Maruts). Unlike water and mountains forests in RV were not associated with the gods… Long time passed before Aryans gradually made use of the forests… It happened in the period following great Vedic collections - Samhitas… Forests are poorly represented in RV… Both rivers and mountains were divinized and reflected in mythology. There was no place for forest in it. RV preserves the names of sacred and profane trees of different species (sometimes they are of local origin)” . Let us see what the most archaic cycles of RV (Mandalas II-VII and IX) tell us about the forests. As far as is known forest is made up of trees. And trees are abundantly and with the use of different words mentioned in the most ancient parts of RV: big trees (vánaspátīn) - 19 times (II.3.10; III.4.10; III.8.1, 3, 6, 11; III.34.10; V.7.4; V.5.10; V.41.8; V.42.16; V.78.5; V.84.3; VI.15.2; VI.48.17; VII.2.10; VII.34.23; IX.5.10; IX.12.7), ordinary trees - 43 times (II.1.1; II.4.5, 6; II.14.2; II.31.1; II.39.1; III.23.1; III.45.4; IV.20.5; V.1.5; V.11.6; V.41.10, 11; V.54.6; V.57.3; V.58.6; V.60.2; V.78.6; V.83.2; V.85.2; VI.2.9; VI.3.5; VI.6.3; VI.8.5; VI.13.1; VI.18.10; VI.24.3; VI.33.3; VI.39.5; VI.48.5; VI.57.5; VI.60.10; VII.4.2, 5; VII.7.2; VII.34.25; VII.35.5; VII.43.1; VII.56.25; VII.95.5; IX.72.5; IX.96.6; IX.97.53), forests (following the very translation of T.Ya. Elizarenkova) - 13 times (II.38.7; III.6.7; III.34.3; III.51.5; IV.7.1, 6; V.41.11; V.78.8; VI.12.3; VI.31.2; VII.1.19; IX.33.1; IX.92.6). It is evident that numerous trees were integral and very well known element of Rigvedic landscape already during the earliest period of Mantras’ composition. Forests around the poets of RV were so large that they were afraid to get lost in them (mā́ no vána ā́ juhūrthāḥ) (VII.1.19). T.Ya. Elizarenkova’s statements about the poor forests’ representation in RVedic religion and mythology also disagree with RV information. We learn that Indra seized big trees (índra vánaspátīm̐r asanod) (III.34.10) and is identified as an ordinary tree (vr̥kṣásya nú te puruhūta vayā́ ví ūtáyo ruruhur indra pūrvī́ḥ) (VI.24.3), that Soma is the lord of the trees or a big tree himself (vánaspátir) (IX.12.7), that Agni’s boons come out of him as branches out of an ordinary tree (tuvád víśvā saúbhagāni ágne ví yanti vaníno ná vayā́ḥ) (VI.13.1). It was under the big trees where Rigvedic Aryans sacrificed (II.3.10; III.4.10; V.5.10; VII.2.10; IX.5.10). Big trees were used to produce and erect sacrificial posts identified with them (III.8.1-4, 6-11). It is contrary to T.Ya. Elizarenkova’s words that only big trees were considered sacred  that Indra is called an ordinary tree (vr̥kṣásya), that Agni is compared to an ordinary tree (vaníno), that Ashvins are described as commanding not only big but also an ordinary tree: ví jihīṣva vanaspate yóniḥ sū́ṣyantiyā iva | śrutám me aśvinā hávaṃ saptávadhriṃ ca muñcatam || bhītā́ya nā́dhamānāya ŕ̥ṣaye saptávadhraye | māyā́bhir aśvinā yuváṃ vr̥kṣáṃ sáṃ ca ví cācathaḥ ‘O tree (vanaspate), spread apart, like the womb (yóniḥ) of a woman about to give birth (sū́ṣyantiyā). Hear my call, Aśvins, and free Saptavadhri. || For the seer Saptavadhri, who is fearful and in need, o Aśvins, you bend the tree (vr̥kṣáṃ) together and apart by your cunning’ (V.78.5-6) . Also we see in the last verses the identification of a tree with a woman-giving-birth  which means that for the Rigvedic IA tree was an aspect of the Divine Mother. T.Ya. Elizarenkova’s words that only big trees were considered sacred disagree with the fact that RV contains stereotyped prayers to big (vánaspátīm̐r, vánaspátibhiḥ) and ordinary (vaníno) trees (námobhir vánaspátīm̐r óṣadhī rāyá éṣe (V.41.8), praíṣá stómaḥ vánaspátīm̐r óṣadhī rāyé aśyāḥ (V.42.16), tán no rā́yaḥ óṣadhīr utá vánaspátibhiḥ || rāyáḥ siyāma dharúṇaṃ dhiyádhyai || tán na óṣadhīr vaníno juṣanta (VII.34.23-25), śáṃ na óṣadhīr vaníno bhavantu (VII.35.5)). It seems indeed very strange for the people unfamiliar with forests not only to compose such prayers but also to ask ordinary trees for blessings while moving into a new locality (apó yéna sukṣitáye tárema ádha svám óko abhí vaḥ siyāma || tán na óṣadhīr vaníno juṣanta) (VII.56.24-25). All these facts point to an active use of forests already in the period of composing of the earliest hymns of RV which is further proved by mentions of timber cutting (VI.8.5; IX.96.6) and fruit gathering (III.45.4; IX.97.53) in the forests and burning wood in the process of metal smelting (dravír ná drāvayati dā́ru dhákṣat) (VI.3.4). Trying to give us evidence of the Rigvedic IA’s poor knowledge of the forests T.Ya. Elizarenkova informs us that ‘RV preserves the names of sacred and profane trees of different species (sometimes they are of local origin)’. But what she ‘forgets’ to make clear is that the endemic trees of the South Asia (khadirá (Acacia Catechu), spandaná (Diospyros embryopteris) and śiṃśápā (Dalbergia Sissoo)) are enumerated as a source of wood to produce the wheeled vehicles only in one of the Family Cycles (Mandalas II-VII) of the Samhita (III.53.19) and nowhere else in it and that RV knows not of any of the out-of-India tree species... The very same hymn mentions the cutting down of one more local tree Bombax heptaphyllum L. or Salmalia malabarica named śimbalá or śalmalí (paraśúṃ cid ví tapati śimbaláṃ cid ví vr̥ścati) (III.53.22) . Poison of Salmalia malabarica is also mentioned in the other Family Mandala of RV (yác chalmalaú bhávati viṣám) (VII.50.3). A die made of an oval nut of the large tree Terminalia bellerica (vibhī́dako) is described in the same Mandala (VII.86.6) . And again next Family Cycle speaks of the big tree Kakambira (mā́ kākambī́ram úd vr̥ho vánaspátim) (VI.48.17). Although it is not identified  its name is evidently local. Maruts are described as flipping off the sky a berry (nā́kam rúśat píppalam maruto ví dhūnutha) (V.54.12) but whether this berry (píppalam) belongs to the famous South Asian tree aśvatthá (Ficus religiosa or Ficus peepul) can’t be said with certainty. J. McIntosh writes of the cult of this tree in the North-Western Hindustan during the Mature Harappan epoch (2600-1900 BCE): ‘A number of tablets show an individual with a pot, apparently making an offering to a tree, usually a pipal. A few seals show figures that may be identified as gods and goddesses inside these trees, particularly the pipal, or under an arch of pipal leaves. These leaves had been a familiar decoration on pottery of the northwest since much earlier times; they were often combined with the horns of bulls or water buffaloes, and together they form headdresses worn by a number of deities’ . But this tree is surely spoken of in the most modern cycles of RV: átrā́ha tád vahethe mádhva ā́hutiṃ yám aśvatthám upatíṣṭhanta jāyávo (I.135.8), vr̥kṣám pári ṣasvajāte | táyor anyáḥ píppalaṃ svādú átti (I.164.20), vr̥kṣé tásyéd āhuḥ píppalaṃ svādú ágre (I.164.22), óṣadhīr mātaras devīr || aśvatthé vo niṣádanam parṇé vo vasatíṣ kr̥tā́ (X.97.4-5) . So we see that the earliest part of RV enumerates five (or may be six) endemic trees of the South Asia - khadirá (Acacia Catechu) (III.53.19), spandaná (Diospyros embryopteris) (III.53.19), śiṃśápā (Dalbergia Sissoo) (III.53.19), śimbalá or śalmalí (Bombax heptaphyllum или Salmalia malabarica) (III.53.22; VII.50.3),vibhī́daka (Terminalia bellerica) (VII.86.6) and aśvatthá (Ficus religiosa) (V.54.12) (a case in dispute). It should be noted especially that the authors of the Mandalas II-VII and IX know not of Ficus religiosa, the cult of which was widely spread in their habitat in III Millennium BCE. This makes us date the core of RV several centuries prior to 2600 BCE at least for IA while entering Hindustan in the III or II Millennium BCE should have learnt of that most venerable local tree at once and mention its name already in the most archaic cycles of RV. That IA learnt at once the names of the endemic trees of the South Asia is proved by the fact of inserting the names of local trees - khadirá (Acacia Catechu), spandaná (Diospyros embryopteris), śiṃśápā (Dalbergia Sissoo), śimbalá or śalmalí (Bombax heptaphyllum or Salmalia malabarica), vibhī́daka (Terminalia bellerica) - already in the Family Mandalas of the Samhita. The fact that IA mentioned the name of Ficus religiosa only in the first and the tenth Mandalas makes it clear that Mandalas II-IX were composed several centuries before 2600 BCE, while Mandalas I and X were added about 2600 BCE and reflected the widespread cult of this tree in Early Harappan and Mature Harappan culture of Hindustan of the III Millennium BCE. So we see that already in the period of composing of the most archaic parts of RV (cycles II-VII and IX) IA lived in immediate proximity of the forests, visited them regularly, used them as source of wood and food, gave names to at least five of the endemic trees of Hindustan, divinized and worshipped trees and considered them aspects of the Divine Mother and Devas. This disproves the Aryan Invasion/Immigration Theory and supports the autochthonous origin of the Rigvedic IA in the North-Western South Asia. 1. Ригведа. Изд. подг. Т.Я. Елизаренкова. В 3 тт. - М.: Наука, 1989-1999; Rigveda. Metrically Restored Text. Eds. K. Thomson & J. Slocum // [Электронный ресурс:] http://www.utexas.edu/ cola/centers/lrc/RV/. 2. Елизаренкова Т.Я. Слова и вещи в Ригведе. - М.: Наука. Издательская фирма «Восточная литература» РАН, 1999. - С. 109-110. 3. Ibid. - С. 109. 4. The Rigveda. The earliest religious poetry of India. Tr. by S.W. Jamison & J.P. Brereton. - Oxford-NY: Oxford University Press, 2014. - P. 761. 5. Елизаренкова Т.Я. Примечания // Ригведа. Мандалы I-IV. Изд. подг. Т.Я. Елизаренкова. - М.: Наука, 1989. - С. 714; Przyluski J. Non-Aryan Loans in Indo-Aryan // Lévi S., Przyluski J., Bloch J. Pre-Aryan and Pre-Dravidian in India. Tr. from French by P.Ch. Bagchi. - New Delhi-Madras: Asian Educational Services, 2001. - P. 6-8. 6. Macdonell A.A., Keith A.B. Vedic Index of Names and Subjects. Vol. II. - L.: John Murray, 1912. - P. 303; Елизаренкова Т.Я. Примечания // Ригведа. Мандалы IX-X. Изд. подг. Т.Я. Елизаренкова. - М.: Наука, 1999. - С. 442. 7. Елизаренкова Т.Я. Примечания // Ригведа. Мандалы V-VIII. Изд. подг. Т.Я. Елизаренкова. - М.: Наука, 1999. - С. 598. 8. McIntosh J. The ancient Indus valley: new perspectives. - Santa Barbara: ABC-CLIO, 2008. - P. 284-285. 9. Macdonell A.A., Keith A.B. Vedic Index of Names and Subjects. Vol. I. - L.: John Murray, 1912. - P. 43-44. So here we have an aDNA paper from Narasimhan et al , published at bioRxiv today. It is a big paper, containing more than 350 ancient samples, from important ancient sites of Central Asia ,Iran and also S Asia. The apparent impression from the first read is that, they have found ''evidence'' of migration from Steppe to S Asia. 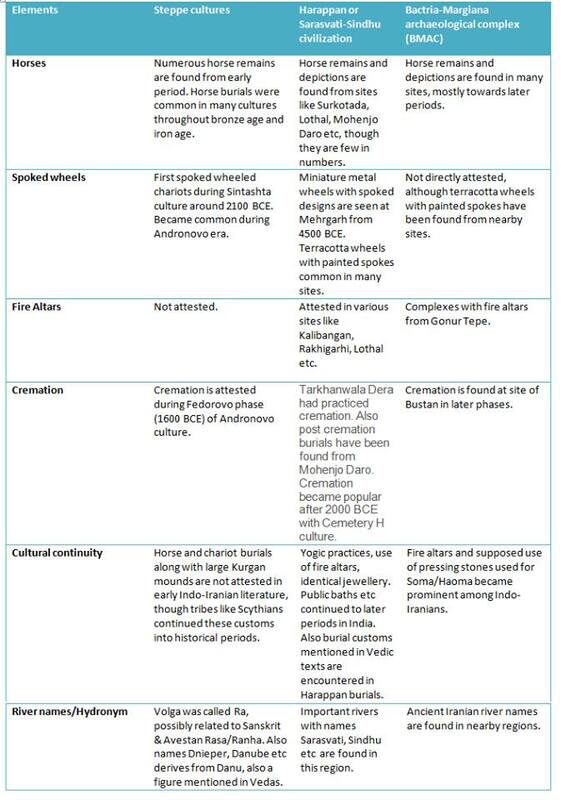 They don't have Mature Harappan samples, which is a shame.The S Asian samples are from Swat/Pakistan dating from only around 1200 bce to historical period. In those samples they have found no R1a except a singleton R1a from Saidu_Sharif_IA I6891 (500-300 BCE) .The archaeological studies from the past have shown that Swat culture had largely female centered characteristics rather than the expected opposite , see here for example.The importance of feminine is also reflected in modern culture of Kalash also, like freedom of women, and goddess cult, see here. Third, between 3100-2200 BCE we observe an outlier at the BMAC site of Gonur, as well as two outliers from the eastern Iranian site of Shahr-i-Sokhta, all with an ancestry profile similar to 41 ancient individuals from northern Pakistan who lived approximately a millennium later in the isolated Swat region of the northern Indus Valley (1200-800 BCE). These individuals had between 14-42% of their ancestry related to the AASI and the rest related to early Iranian agriculturalists and West_Siberian_HG. Vagheesh M Narasimhan et al. Today the desert margins of northwest India are dry and unable to support large populations, but were densely occupied by the populations of the Indus Civilization during the middle to late Holocene. The hydroclimatic conditions under which Indus urbanization took place, which was marked by a period of expanded settlement into the Thar Desert margins, remains poorly understood. We measured the isotopic values (δ18O and δD) of gypsum hydration water in paleolake Karsandi sediments in northern Rajasthan to infer past changes in lake hydrology, which is sensitive to changing amounts of precipitation and evaporation. Our record reveals that relatively wet conditions prevailed at the northern edge of Rajasthan from ~5.1 ± 0.2 ka BP, during the beginning of the agricultural-based Early Harappan phase of the Indus Civilization. Monsoon rainfall intensified further between 5.0 and 4.4 ka BP, during the period when Indus urban centres developed in the western Thar Desert margin and on the plains of Haryana to its north. Drier conditions set in sometime after 4.4 ka BP, and by ~3.9 ka BP an eastward shift of populations had occurred. Our findings provide evidence that climate change was associated with both the expansion and contraction of Indus urbanism along the desert margin in northwest India. Location of (A) Urban Harappan sites at ∼4.6–4.5 ka BP and (B) Post- Urban Harappan after ~4.1–4.0 ka BP sites in NW India as denoted by the orange dots in each case. Note that the urban-Harappan sites are located on the margin of the Thar Desert and the post-urban Harappan sites are clustered to the right of paleolake Karsandi on the Indo-Gangetic plains. The location of Karsandi shown by the white triangle and other reported paleolakes in black triangles. It is increasingly evident that the landscapes across which Indus populations lived were diverse in terms of climate, geology and ecology, and the patterns of cultural behavior and response to climate variability are unlikely to have been uniform throughout the Indus region16,24. The paleoclimate record from paleolake Karsandi clearly suggests there were areas receiving favorable rainfall in the period leading up to the development of Indus urban centres along the northern fringe of the Thar Desert in NW India. This evidence underscores the importance of reconstructing local conditions for understanding the degree of adaptation and resilience of ancient civilization exhibited to climate change. Abstract:Painted Grey Ware culture is one of the significant archeological cultures of northern India.It has been a subject of attraction and debate among scholars. The most crucial aspect about this culture has been its chronology and its proposed relation to the Mahabharata.The issue of its authorship is equally important.This article discusses all these issues afresh in the light of the new radiocarbon dates obtained from various sites and the first author’s detailed archaeological survey in the Mathura region, a core area of Painted Grey Ware culture. This article voices for a change in the accepted chronology of this culture and takes back its antiquity by many centuries. A proposition is also made about the place of origin of this culture which differs from the earlier propositions. Language, which allows complex ideas to be communicated through symbolic sequences, is a characteristic feature of our species and manifested in a multitude of forms. Using large written corpora for many different languages and scripts, we show that the occurrence probability distributions of signs at the left and right ends of words have a distinct heterogeneous nature. Characterizing this asymmetry using quantitative inequality measures, viz. information entropy and the Gini index, we show that the beginning of a word is less restrictive in sign usage than the end. This property is not simply attributable to the use of common affixes as it is seen even when only word roots are considered. We use the existence of this asymmetry to infer the direction of writing in undeciphered inscriptions that agrees with the archaeological evidence. Unlike traditional investigations of phonotactic constraints which focus on language-specific patterns, our study reveals a property valid across languages and writing systems. As both language and writing are unique aspects of our species, this universal signature may reflect an innate feature of the human cognitive phenomenon. We have used a database where the relatively few sequences which are believed to have been written from left to right have been reversed so as to be oriented in the same direction as the majority, following standard procedure used for constructing concordances for Indus Valley Civilization inscriptions. We observe from Fig 3 that the ΔG for sign usage distribution is positive, indicating that the choice of signs is less restricted in the right terminal position than the left. This would suggest, based on the connection previously seen between the sign of ΔG and the direction of writing, that the IVC inscriptions are written from right-to-left, which corroborates the consensus view as mentioned above.